Dhyan Chand is an Indian hockey player. He was born in 29th august 1905.He played for the Indian Hockey team and won three Olympic gold medals in 1928,1932 and 1936.He is best known for his goal scoring abilities.He scored more than 400 goals during his international carrier . He was born in Allahabad ,India. Dhyan Chand joined the Indian army at the age of 16 where he played hockey for the Indian army.He played well for the army and he was selected to represent India in the Amsterdam Olympics of 1928,where India won its first Olympic Gold medal.Dhyan Chand was the top scorer of the tournament.He played many matches for India in overseas tours. Dhyan Chand again was influential in India's gold medal win at Los Angeles Olympics 1932. He was the captain of the Indian team that won gold at the Berlin Olympics.He scored three goals on the final against Germany ,a match which India won in the margin.8-1. 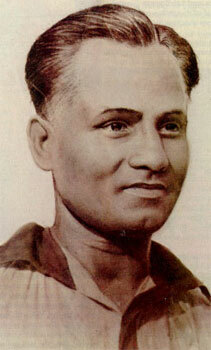 Dhyan Chand played his last international match in 1948. He was honoured with Padma Bhushan(India's third highest civilian honour) in 1956. His autobiography ''Goal'' was published in 1952. He died on 3rd December 1979 at Delhi.